A work by Professor Ho Ri Moon (left) in the School of Natural Science at UNIST has been appeared in J. Am. Chem. Soc. From left are Professor Moon and Jin Yeong Kim, the first author of the study. A work by UNIST-GNTECH-MPI international research team appeared in the JACS on December 4, 2017. A new study by an international team of researchers, affiliated with UNIST has announced that they have succeeded in developing a novel deuterium separation method, using a special class of metal organic frameworks (MOFs) whose pore dimensions change upon gas adsorption. This new strategy allows ‘deuterium (Chemical symbol D or 2H)’ to diffuse more quickly through the expanded pores of MOFs in response to hydrogen gas adsorption. 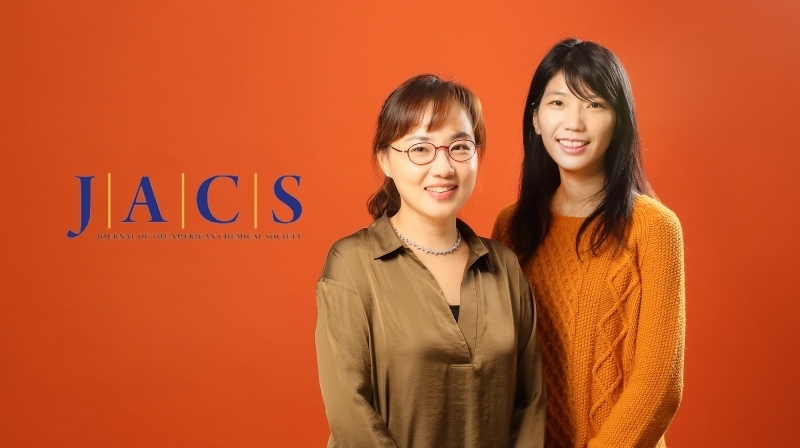 This breakthrough comes from a recent study, led by Professor Hoi Ri Moon in the School of Natural Science at UNIST in collaboration with Professor Hyunchul Oh of Gyeongnam National University of Science and Technology (GNTECH), and Dr. Michael Hirscher of Max Planck Institute for Intelligent Systems. Published in the November 27th issue of the Journal of the American Chemical Society, the study demonstrates the dynamic change of pore can provide the tremendous opportunity to separate mixtures of similar-sized and similar-shaped molecules that require precise pore tuning. Flexible metal-organic frameworks (MOFs) are unique class of materials that exhibit dynamic change of pore aperture, triggered by external stimuli. In Flexible MOFs, adsorption and desorption of guest molecules, changes in temperature, and even mechanical pressure result in the expansion and contraction of pore diameter, the process similar to the breathing mechanism. In the study, the research team has experimentally investigated the dynamic breathing transition of the flexible MOF system, MIL-53(Al), for efficient hydrogen isotope separation. The study has attracted much attention in the academia as this is the first attempt to exploit the structural flexibility of MOFs caused by the breathing phenomenon for hydrogen isotope separation. 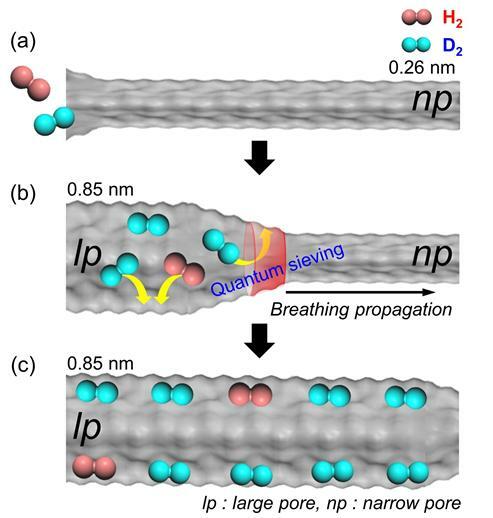 In the study, Professor Moon and her research team have challenged themselves in providing a strategy for effectively separating hydrogen isotopes through the dynamic pore change during the breathing of MIL-53(Al). The MIL-53(Al) is a representative of flexible MOFs with a network structure, resembling that of long rubber tube with both ends open. At a cryogenic temperature (-233 °C), narrow pores (0.26 nm, 1 nm = billionth of a meter) in MIL-53 (Al) have increased to large pores (0.85 nm) upon hydrogen gas adsorption. The expansion begins at the enterance and progapages to the center. Here, deuterium diffuses much more faster than hydrogen. The diffusion of deuterium occurs closer to the center where narrow pores are situated. As a result, only deuterium remains in MIL-35 (Al). The researchers systematically adjusted the pore structure by changing the exposure temperature, pressure, and time to find the optimal pore structure of MIL-53(Al). As a result, a large amount of deuterium (12 mg) per 1 g of MIL-53 (Al) could be separated. For reference, in the previous study, the amount of deuterium separation were only 5 mg per gram of porous material. This study has been supported by the National Research Foundation of Korea (NRF), funded by the Korean government (MSIP). Jin Yeong Kim, et al., “Selective Hydrogen Isotope Separation via Breathing Transition in MIL-53(Al)”, J. Am. Chem. Soc., (2017).